New York has become one of the epicenters for the ongoing protests for equal justice and police accountability sparked by a Staten Island grand jury’s decision to not indict a police officer for the death of Eric Garner. Two of NY’s biggest Hip Hop representatives have now stepped up to lobby New York’s governor Andrew Cuomo to reform the state’s criminal justice system. 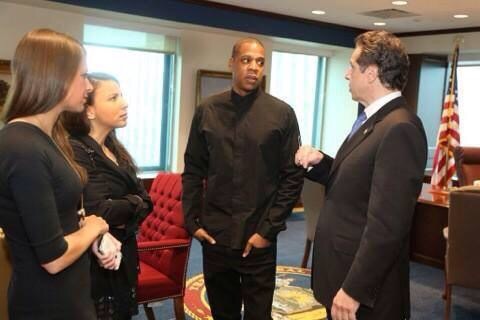 Shawn “Jay Z” Carter and Russell Simmons met with Gov. Cuomo on Wednesday. The governor’s office described the meeting as “a productive conversation” that included a discussion about assigning special prosecutors to handle criminal cases involving police officers. Many observers have criticized the idea of regular state prosecutors investigating the police, because the district attorney’s office and the local police departments work so closely together. Should Prisons Allow FaceTime/ video Calls with Inmates? What are the Pros and Cons?? We are a long ways away but it’s better than nothing being done at all. It’s a start..but it will take. .more.. It may help with constant consistency, but it starts with people changing themselves within and being active in their own communities first to actually come together for change to come. Petitions are a great start, but we know when it comes to some celebrities they will only go so far because they don’t want to risk corporate sponsorship or their brand. Not saying Russell or Jay-Z but we know how it goes sometimes.